For this exploration, I will look at the equation for various a values and use those graphs to predict higher a values. First letÕs look at . 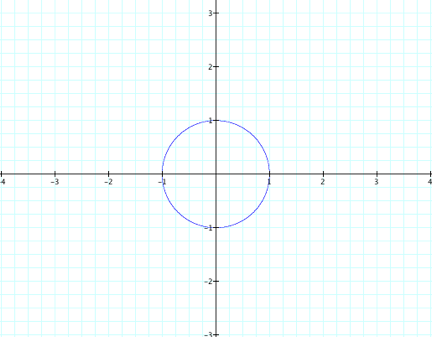 Notice how it is a circle of radius 1 centered at the origin. Next letÕs look at in relation to the previous graph. Notice how the function is tangent to the previous one at and , the function decreases in the second quadrant and fourth quadrant, and it curves around the previous graph in the first quadrant. Now letÕs add to our graph. 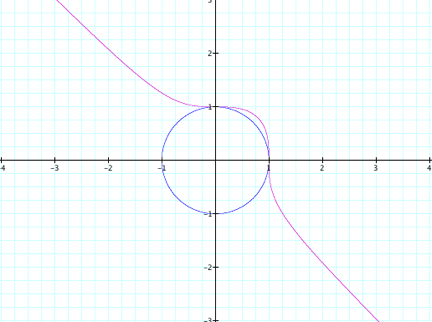 In this case, the new function is centered at the origin just like the first function and it is tangent to the first function at , . 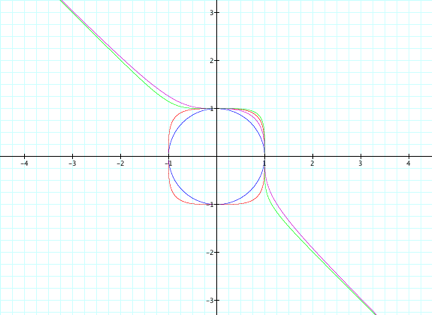 Instead of being a circle like the first equation, the corners are slightly rounded. Notice how for each , the y-value for the third equation is greater than the y-value for the second equation. Finally letÕs add to our graph. 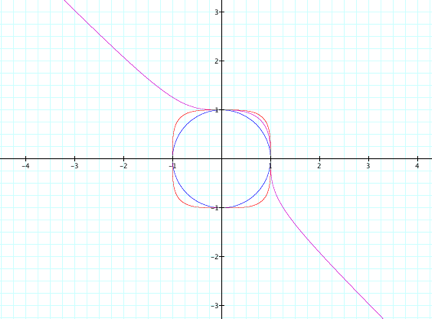 This new function is similar to the second function. Like the second function, it decreases in the second and fourth quadrants and it curves around the first function in the first quadrant. Moreover for each , the y-value for the third equation is greater than the y-values for the other equations. Now I must predict what the graphs of and look like. 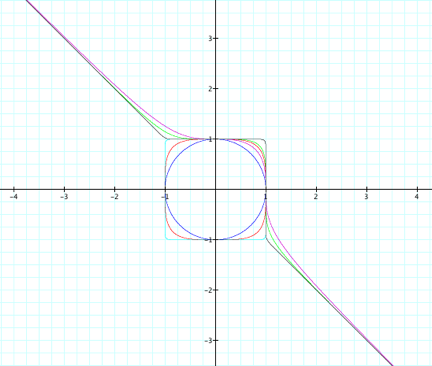 Above I noticed that the graph of is tangent to the graph of at four points, but it resembles a square with rounded corners. Based on the graphs of and , I would predict that would resemble a square even more than , but it would still be tangent to at the same four points as . Below is the graph of . Above I noticed that and were tangent to at two points. They both also decreased in the second and fourth quadrants and curved around in the first quadrant. Notice that when and , the y-value for is less than the y-value for , but when , the y-value for is greater than the y-value for . I would predict that when and , the y-value for would be less than the y-value for , but when , the y-value for would be greater than the y-value for . Now letÕs add to our graphs. In both cases, my predictions were true.